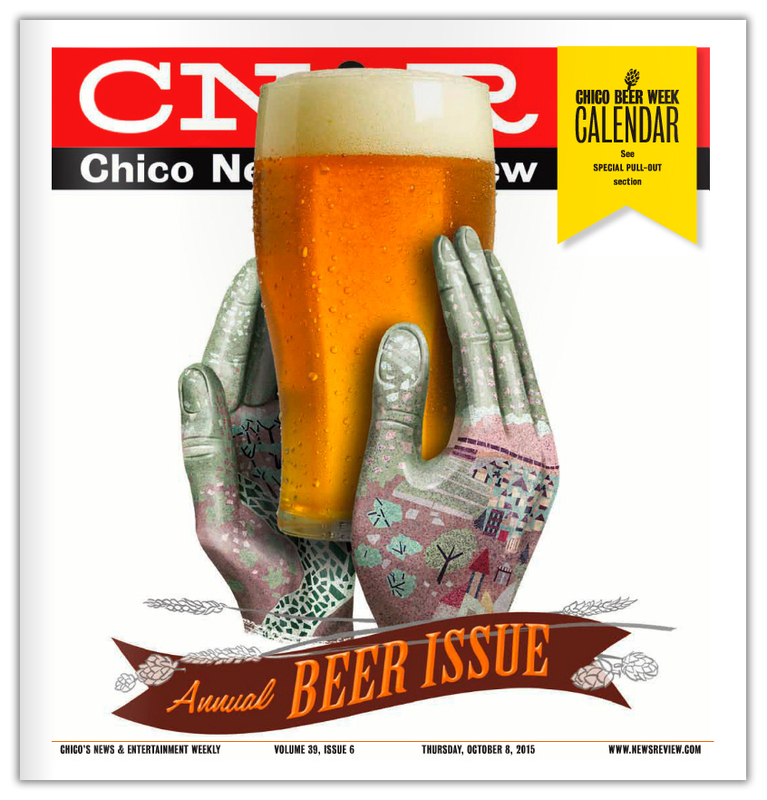 I was asked by Chico News & Review to design the cover for their Annual Beer Issue which highlights the microbrewing culture in and around Chico, California. The A.D. wanted a local sculpture drawn holding a glass of beer. The sculpture is fairly large and is a landmark for the area. Pretty simple task except the photos I had to work with were less than stellar. They wanted it to be as detailed as possible so it would be instantly recognizable to local readers. The difficulty came mostly because the surface of the sculpture changed colors depending on the angle of the photo and the light. Plus, the mosaic details were hard to discern in some areas because of glare. I was able to piece it together though and used a few of Kyle T. Webster’s special effects brushes to make the task easier. In the initial sketch phase, I did a few rough background designs to go along with the image. In the end, they opted for a plain white background. The designer in me always wants to add fonts/titles but a lot of times this is handled by the A.D. That’s just par for the course, and I think this time it turned out nice and simple. When the final art was finished, I dropped in a high res stock image of beer and added some shadows on the glass and hand. I left everything on layers so the positioning could be adjusted by the A.D. Below is the final cover.